It's been 12 years since Nora Ephron made You've Got Mail, and it hasn't been easy - she has never been able to top, or even match the magic of, that film. Finally, her redemption begins; she appears to have realized what it was that made that film tick - the combined power of Hanks' and Ryan's easy charm and affable performances, and the domestic banter that raised the film's standard. The first things Ephron does right in this film about Julia Child's struggle to write a French cookbook and Julie Powell's blog about trying to save her marriage by cooking through all of that book, is cast one of the most likable actresses in recent years as the clambering Julie Powell - Amy Adams. Adams has the easy charm and a keen understanding that makes her poorly-written character someone you care about. The second and most important masterstroke was to cast Meryl Streep as the effervescent Julia Child. Meryl Streep on a bad day is eminently commanding in her screen presence and thoroughly likable no matter what. Streep, then, is the magic ingredient that makes this could-have-been-middling-cooker film very, very special. Her performance is both physical and deeply psychological at once - making you care for her, and always keeping your spirits high. In the twin timeline that the film straddles, you await the Julia Child segments with keen intensity - you want to be in the presence of that gorgeous, happy woman and her high-pitched laugh all through the running time of the film. There are method actors who try and get under the skin of the character, and then there are physical actors who completely transform themselves and then perform the best approximation, while keeping their own charm intact. Streep is the second kind of actor, and the film plays to her strengths completely. The rest of the cast is serviceable at best, with one or two slightly cringe-worthy moments by extras - the leads are so good, the rest of the cast has a high bar to clear. The sole exception is Stanley Tucci, who has a graceful and careful presence he rarely lets overshadow the centerpiece of Streep's performance, all the while making his own, indelible. This is a Nora Ephron film, however, and it is too easy for her not to fall into the trap of pairing off an extrovert who makes faces and a cute girl with a heart of gold. The predictability and more importantly the need for a better script and faster editing makes this film only the first step in the recovery of Ephron's filmmaking. The script itself has many holes - there are at least two characters that are presented as central and pivotal to the narrative, and then their threads are left hanging loose. It's a good thing then that Ephron really knows how to showcase her cooking. In a film about cooking, it is easy to gloss over the food, or to go as technical as to stave off keen audiences. Julie & Julia is neither, instead carefully constructing a narrative that makes you want to buy a copy of Julia Child's cookbook. It is unfair that the person who brought Julian Child's cookery to new audiences is given such a short shrift in the film. Even with the intensely likable Adams, the character isn't the best written. It is also unfair that the film that showcases Streep's acting so beautifully is written so haphazardly. Despite that, however, Ephron knows how to make an enjoyable film about women, and this is exactly it. Savour the moments and enjoy Streep's magnificent performance, and you will likely enjoy it more. This is a great weeknight movie in that it isn't taxing and is casually enjoyable throughout its running time. 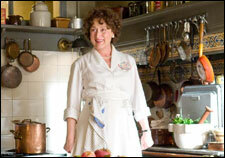 Be the first to comment on Julie & Julia! Just use the simple form below. fullhyd.com has 700,000+ monthly visits. Tell Hyderabad what you feel about Julie & Julia!